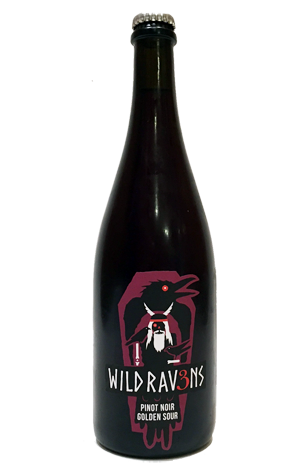 The last of the current quartet of Wild Ravens mixed fermentation beers from 3 Ravens is something of a misnomer. It may say Golden in the title but here is a beer that has picked up so much juice from the Kilmore Pinot Noir pomace from Payten & Jones with which it spent time canoodling that it presents more like a sangria or a sparkling red – it possesses a ruby hue and a pinkish, rapidly dissipating head. It's a companion piece of sorts to the Riesling Golden Sour that kicked off this quartet and one that is considerably more wine like despite starting out as a golden ale brewed with oats and rye before maturation in wine barrels with wild yeast and bacteria. The beer has picked up plenty of cherry and berry fruit character, not to mention some perfume like and estery aromas too. There are some bready malts tucked in behind those fruits to remind you it is a beer – well, a hybrid, at least – at heart, one with a clean and potent mineral like acidity to aid refreshment.